PRESS RELEASE: Record your guitar on your iPad , wherever you are with Griffin's GuitarConnect Pro. If you have an instrument with a 1/4" plug and an iPhone or iPad, the GuitarConnect Pro will turn your iPad or iPhone into a compact digital performance or practice rig. So you can play, record and multitrack whenever the mood strikes. Simply plug your instrument into GuitarConnect Pro's 1/4" mono input for 100% digital connection from your instruments into GarageBand or any app that taps into your iPad's powerful Core Audio capabilities. Great for instrumentalists, because GuitarConnect Pro makes it easy to record multiple tracks all with 24-bit 48 kHz sound. GuitarConnect Pro also features an adjustable gain control to determine the strength of your input levels. 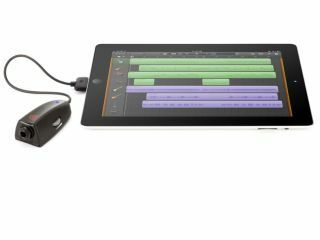 Compatible with Garage Band, JamUp Pro and iShred Live apps.